On more than one occasion, when I’ve told people about this blog I’ve been asked: “have you heard about John Schlimm’s upcoming book The Tipsy Vegan?” John Schlimm is the author of 11 books, including The Ultimate Beer Lovers Cookbook, and is a member of one of the oldest brewing families in America, Straub Brewery in Saint Marys, Pennsylvania. Needless to say John’s latest book on cooking vegan with booze was right up my alley and I was stoked when we were generously provided a pre-release copy to review (many thanks to Lara at Da Capo Press). I had hoped to make a wide variety of dishes before this release-day review, but only had time for one dinner. Let me be clear, though, the recipes couldn’t be much easier…it was my “research” of things boozy that has kept me from cooking & writing. The fact that the recipes use simple ingredients and are very easy to make are a big plus for people who don’t want to spend a lot of time in the kitchen. Also, unlike so many vegan recipe books and blogs that center on meat analogues, there is an obvious focus on vegetables, something I really appreciate. 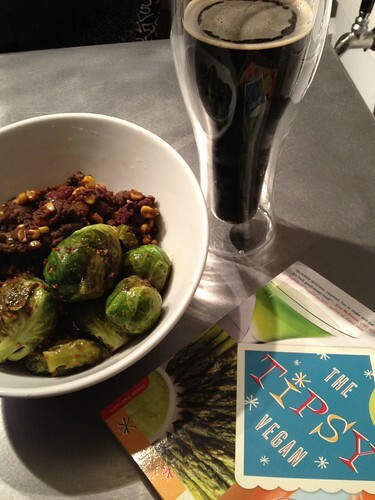 Tonight I made Blitzed Brussels Sprouts Moutarade, sprouts cooked in a cognac-infused mustard sauce, and Bottom’s Up VegeBean Stew, a hearty bean and vegetable stew cooked in beer broth. All was served over quinoa (not the first time you’ve seen these ingredients together on VeganBrew). 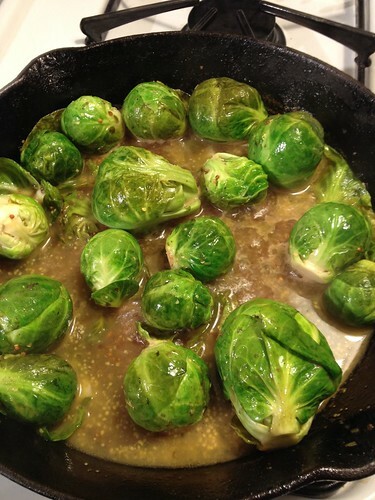 The Brussels sprouts were easy to make and very tasty! I’ve never cooked with ‘yack before, but absolutely love it. The oak and fruit from the cognac are nicely balanced with the strong flavors of mustard and lemon. The slight bitterness of the Brussels sprouts add another layer of goodness. Big fan of this recipe. The vegetable and bean stew calls for 12 oz of beer of your choice, with the suggestion of either light lager (for cool, summer stew) or a dark beer (for a fall/winter warmer). John also encourages adding homebrew or spices to make the beer unique each time. I did take his advice, using applewood smoked “bacon salt” (thanks Kev), fava beans in place of lima beans and homebrewed dry stout for the beer (more on this beer later.) Definitely a tasty meal, though I probably should have cooked the stew as long as the recipe instructed (2.5 – 3 hours) to get the full flavor experience. No doubt, the perfect recipe for a slow cooker! My only complaint about the book would be that I expected more beer recipes – more like a veganized version of The Ultimate Beer Lovers Cookbook. Nonetheless, my first experience with The Tipsy Vegan is a success and I look forward to making other recipes. I’ve already bought the ingredients for the Lentils in the Fast Lane and The Boozer’s Smoky-Spicy Baked Beans. This is a great cookbook that would make for a fun gift for the vegan boozer in your life. Get yours today!